Epson is looking forward to the iconic nightime Singapore Grand Prix by taking a fresh and exciting look at a Formula 1™ car and pit stop. The ambitious plan to create what is believed to be the world’s first glow-in-the-dark pit stop combined Epson’s market leading products with the proven excellence of the reigning Formula One™ World Constructors’ Champions, Mercedes-AMG Petronas Motorsport, featuring three-time World Champion driver, Lewis Hamilton. Epson began by transforming the Mercedes-AMG Petronas race car from its normal state into a glow-in-the-dark masterpiece. 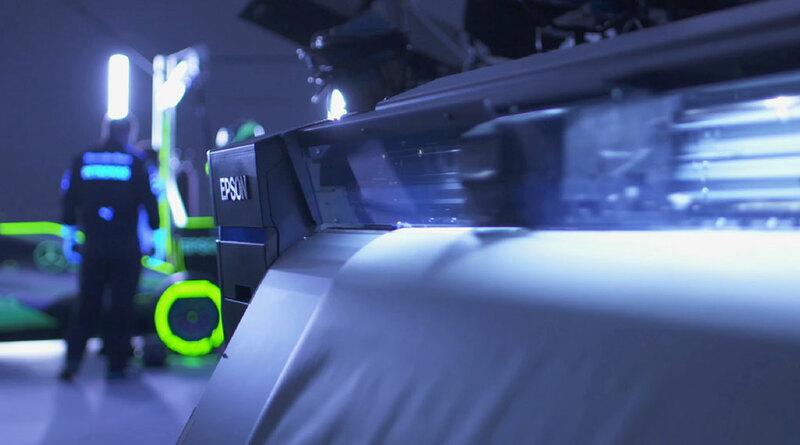 An Epson SureColor SC-S Series printer enabled the Mercedes-AMG Petronas Motorsport design team to transform the 2016 World Championship winning livery by printing luminous material that was wrapped around the car and glow-in-the-dark versions of the car’s iconic branding. The lights were then turned off and the crew completed the world’s first ever glow-in-the-dark pit stop. Complete with glowing overalls and equipment, the team conducted several rapid tyre changes. The effect was enhanced by the Epson’s flagship EB-L25000U, the world’s first and brightest 3LCD laser projector with 25,000 lumens plus 4K Enhancement, which is designed for dynamic and high-impact production*1. The concept was designed to encourage Formula 1 fans to look at pit stops in an entirely new light, while demonstrating the global technology leadership of both Epson and Mercedes-AMG Petronas Motorsport in a compelling manner. The 2017 race calendar next sees the championship travel to Singapore, where Mercedes-AMG Petronas Motorsport will be looking to consolidate their championship lead at this iconic ‘F1 night race’. With over 1600 lights illuminating the famous city circuit four times brighter than most football stadiums it is a spectacle welcomed by fans globally. To celebrate this night race, the glow-in-the-dark content will be released on Epson and Mercedes-AMG Petronas channels over the Singapore GP race weekend (15-17 September 2017). The glow-in-the-dark pit stop is part of a series of innovative activations between Epson and Mercedes-AMG Petronas, which includes last year’s #LewisGetsInked campaign and the 2017 Lewis Hamilton F1 Ink Tank Challenge (https://www.epson.co.uk/lewisgetsinked). A video of the glow-in-the-dark and other content will be released on Epson channels shortly.